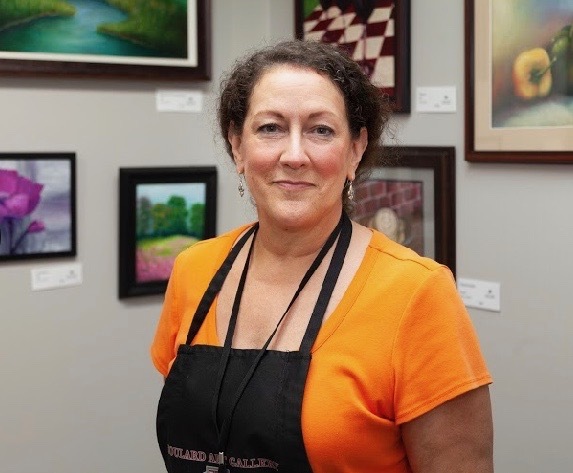 A self-taught artist born and raised in the Metro-East, Karen was interested in art from an early age, when her Mom set her down with colors and a coloring book, while her three younger siblings went down for a nap. Life Interrupted, when career transported her the west coast in her early 20’s. 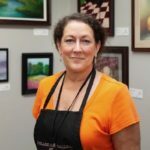 But love of creativity never went away, so when she returned to the St. Louis area and started a family at 40, she started taking art classes and workshops. After experimenting in all mediums, Karen is exploring the expressive use of color in soft pastels and oils. The rich colors all set in an atmosphere of peace, gentleness and beauty. Karen feels that we should be able to surround ourselves with beautiful art in our homes and offices, not just when we visit museums and galleries. She hopes her artwork communicates, joy beauty and serenity. Karen currently lives on 18 acres with her husband, son, 2 dogs, 3 cats, 15 chickens and one noisy rooster.